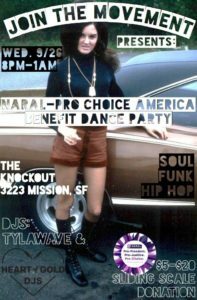 Join the Movement is excited to team up wth the amazing Heart of Gold DJS and throw our next fundraising DANCE PARTY at the legendary Knockout for NARAL-Pro-Choice America! DJ Tylawave and Heart of Gold DJ babes Ashleyanne, Christie, and Paige will provide all the jams for you to boogie to! We will also have a raffle with some awesome prizes to give away! Please come out and support Reproductive Justice for ALL! Lets resist Brett Kauvanaugh and his well-funded opposition to assessable and affordable birth control and abortion! NARAL Pro-Choice America organization in the United States that engages in political action and advocacy efforts to oppose restrictions on abortion and expand access to abortion. As always, all proceeds from the party donated to the cause!